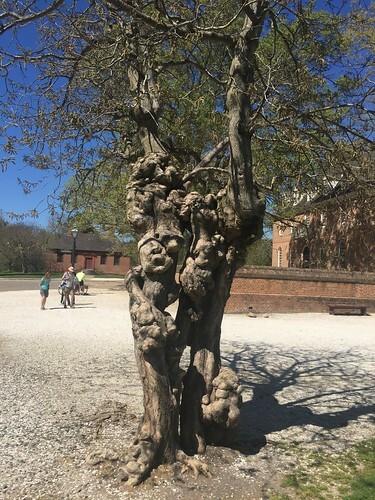 On a recent visit to Williamsburg, Va., the restored colonial capitol of Virginia, I noticed a row of obviously ancient, gnarled paper mulberry trees (Broussonetia papyriffera) growing in front of the Capitol building. Why would this Chinese tree be used to landscape a public space in the 18th century? Paper mulberry is a fast growing deciduous tree of the mulberry family that has a broad spreading crown and a mature height of 35-40 feet. It has gray-brown smooth bark that takes on gnarled, Tolkienesque qualities as the tree ages. Unfortunately, trees send up sprouts from the roots, so unless the tree is isolated in a lawn area where these unwanted shoots can be kept mowed, a thicket of paper mulberries is likely to develop. The light green leaves are 4-6 inches long, ovate in outline with serrate margins and softly pubescent beneath. Leaves may be simple with no lobes,, or once or twice lobed. Detached leaves have a milky sap. In the fall they produce decent yellow fall color. 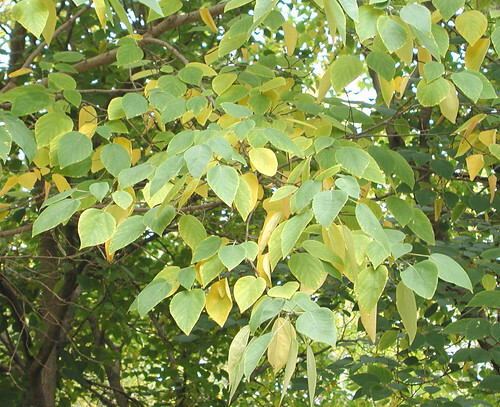 Paper mulberry is a dioecious plant with male and female individuals. The fuzzy male catkins are 2-3 inches long, pinkie finger size and often curled like the “snakes” we used to set alight for July 4 celebrations. The female flowers are round balls that can produce an orange-red fruit in late summer. I’ve never seen the plant produce fruit. Most of the plants growing in the South, where the tree is now considered a weed tree, are clonally propagated males. The four known species of paper mulberry are widely distributed in East Asia and Polynesia where they have been used for centuries by indigenous cultures. In China the long, easily extracted fibers were used in paper making with the fibers held together by rice glue. The paper lanterns used in Japan were traditionally made from the fibers of this tree. The leaves were used to feed silkworm caterpillars when trees were harvested for paper making. As the people we think of as Polynesians began their migration into the vast expanse of the Pacific Ocean many centuries ago, they took with them roots of paper mulberry from East Asia. It made it as far as Hawaii by means of this eastward migration. The white inner bark was stripped into long ribbon like pieces, pounded together and then bleached in the sun to make tapa cloth, their main fiber used in clothing. In 1753, Linnaeus classified this tree as a Morus papyrifera, so it is not surprising that American colonial planters were also confused about the tree. It appears plants were first introduced into North America by Andre Michaux in 1785 when he came to our shores to study trees. Paper mulberry may not have been planted during the time Williamsburg served as the Colonia Capitol of Virginia (1699 – 1780), but it was no doubt planted soon after it arrived in this country because there was a lot of interest in wresting the silk industry from China. Though the silk craze didn’t reach its bubble period until the 1830’s, planters and entrepreneurs of the period thought silk manufacturing was going to be a very profitable business. Though considered a weed tree and not worthy of growing, you still see patches of male paper mulberry throughout the South. It tolerates poor, dry soils and difficult inner city conditions. My father planted a tree on our dry central Oklahoma farm about 1960. By the end of the decade the tree – about 50 feet from the house – was only about 10 feet tall and just making do with the dry site. But we developed a leak in a bathroom pipe, and when I crawled under the house to fix it, I was greeted by a forest of paper mulberry suckers that had found the moisture and were having a merry old time in the dark crawl space.